OK, I have to admit that I am guilty. I work for an institution that describes itself as learner-centred, and I teach a course on University Teaching in which I aspire to create a learner-centred environment. Until this point, I don’t think I have taken the time to ACTUALLY articulated (yes, I would say that I have reflected upon it!) what I truly mean by this term that seems to be used so elusively in higher education today. So, here goes…and as a disclaimer, I truly hope that this personal exploration continues to evolve!! A learner-centreded approach clearly places the learner at the centre of their education, by supporting student development & autonomy, and creating a shared-climate for learning (Newmaster et al., 2006; Weimer, 2002). Learner-centredness puts a clear focus on the outcomes of learning, and recognizes that, “students must be active discoverers and constructors of their own knowledge” (Barr and Tagg, 1995, p.21). Learners are guided by a philosophy of self-efficacy and autonomy, where they develop the knowledge and abilities necessary to embrace learning challenges, to succeed, and to continuously improve. Learner-centred environments facilitate active, enduring, integrated and authentic experiences that, “…enabl[e] the learner to remodel and revise ongoing theories in a manner that makes sense to them” (Newmaster et al., 2006, p. 108). Simply stated, learner-centred environments provide students with an opportunity to actively engage with and to take ownership of their own learning. The Responsibility for Learning: Students take responsibility for their own learning and are motivated to succeed; students do the discovering. Activities and assignments become the vehicles for learning. Evaluation Purpose and Process: Generate grades AND promote learning (what I like to refer to as “active assessment”). Aside comment: As there has been a fundamental shift in higher education from passive to active learning, I think there is an evolving shift from active learning to active assessment currently occurring in higher education. As we all know, assessment has an incredible impact on What, When and How students learn!! Like I said at the beginning, I am quite certain that my personal reflections regarding learner-centredness will continue to evolve! Barr, R.B. and Tagg, J. 1995. 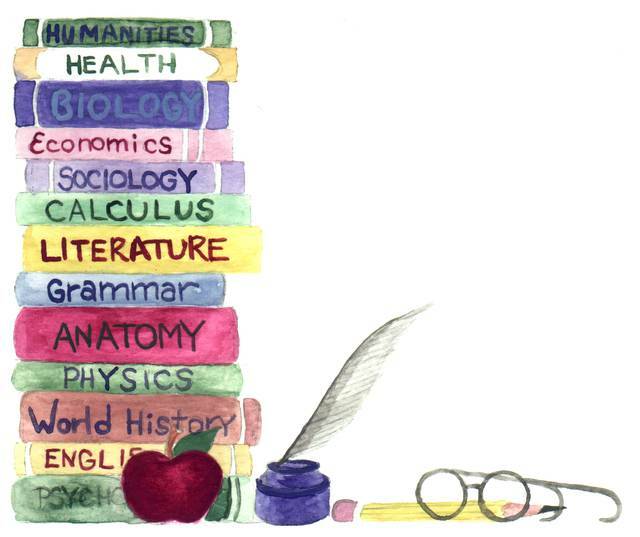 From Teaching to Learning – A New Paradigm for Undergraduate Education. Change. Nov/Dec: 13-25. Newmaster, S., Lacroix, C.A., and Roosenboom, C. 2006. Authentic learning as a mechanism for learner centredness. International Journal of Learning 13(6): 103-112. Paris, C. and Combs, B. 2006. Lived meanings: what teachers mean when they say they are learner-centered. Teachers and Teaching: Theory and Practice 12:571-592. Weimer, M. 2002. Learner-Centered Teaching. Jossey-Bass, San Francisco. silence is an endemic, essential part of the rhythm of the learning process. We were also reminded of how important it was to reflect critically on our own experiences as learners, as we, ourselves grow as teachers. How we study our own autobiographies as learners is essential to our development as teachers. I was left most inspired by Brookfield’s humble and real reflections on the feelings we all face in our teaching practice, and how difficult it is to look beyond our assumed ‘faults’ and ‘vulnerabilities’ as we teach – no matter how experienced we are in the classroom. So what is critical reflection anyways? Transforming these assumptions to become more inclusive and integrative, and using this newly-formed knowledge to more appropriately inform our future actions and practices. Becoming a critically reflective thinker and practitioner can be challenging. 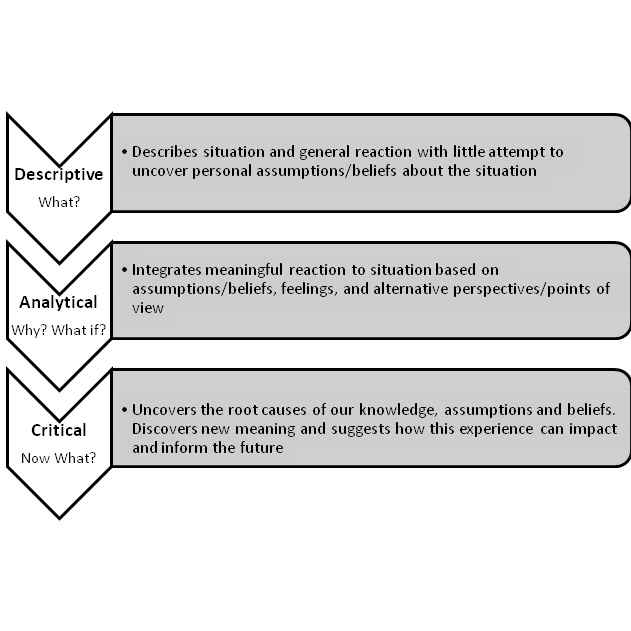 The process of critical reflection may be conceptualized through the descriptions and questions contained in the following two figures (adapted from Brookfield 1990, 1995; Mezirow, 1990). Brookfield, S.D. 1995. 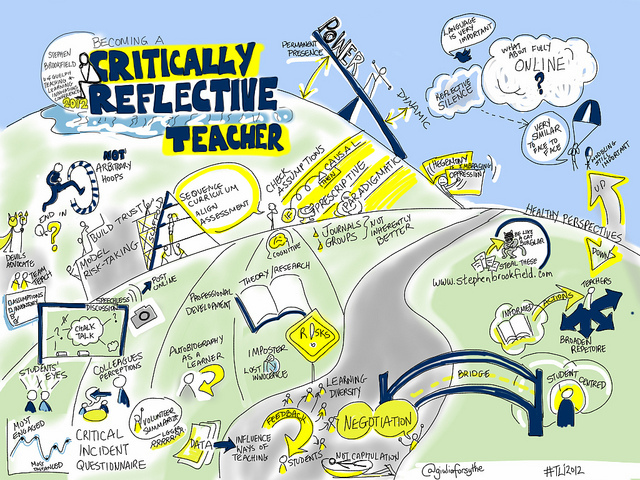 Becoming a Critically Reflective Teacher. Jossey-Bass, CA. Brookfield, S.D. 1990. Using critical incidents to explore learners’ assumptions. In pages 177-193 of J. Mezirow (Ed). Fostering Critical Reflection in Adulthood. Jossey-Bass Publishers, San Fransisco. Mezirow, J. 1990. 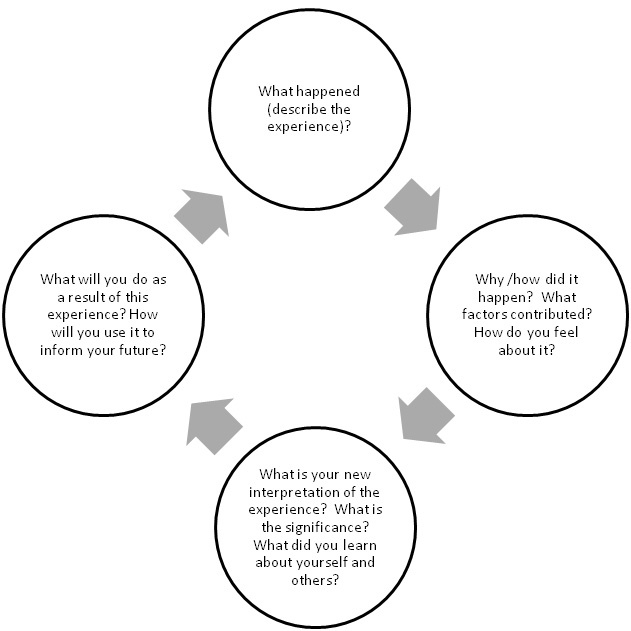 How critical reflection triggers transformative learning. In pages 1-20 of J. Mezirow (Ed). Fostering Critical Reflection in Adulthood. Jossey-Bass Publishers, San Fransisco. I recently read Peter Knight’s (2001) presentation of a process-based approach to curriculum planning and development. A critic of outcomes-based approaches to higher education, he argues that complex learning can “not easily [be] reducible to precise statements” that “grow like mould and become unwieldy” (p.373); and that these approaches run the risk of reducing creativity, innovation, and flexibility; threaten faculty autonomy; and, represent a ‘reductionists’ approach to learning. Although I certainly don’t agree with all of Knight’s critiques, and firmly believe that learning outcomes provide an extraordinary framework for structuring and aligning curricula, Knight provides some excellent arguments for focusing intentionally on the quality of learning encounters and environments. In fact, I think some of Knight’s suggestions help to support a holistic approach to curriculum development, which focuses on outcomes, processes, and the creation of quality learning environments and communities. Knight states, “…that planning starts by imagining how to draw together the processes, encounters or engagements that make for good learning” (p. 375). Disciplinary subject matter and context need to be thoughtfully considered, and “…key messages and learning encounters need to be planned to suffuse the programme” (p.376). We should clearly define and articulate the signature pedagogies and learning environments which inherently support and promote a deep approach to learning within each programme. This approach begins, “…by asking what good learning, teaching and assessment encounters in the subject area are…” (p. 376). Knight also argues for processes which support student development and progression through the intentional scaffolding of learning experiences. He clearly articulates the need for the creation of collaborative learning communities, “…it is fair to say that good curriculum would plan for learning to take place through communities of practice in which groupwork and peer evaluation are normal, interpersonal contact is common and networks of engagement are extensive” (p.377). A further criterion of curriculum coherence is a ‘coherence of feedback’, where formative feedback is provided to students throughout the program, “about their achievements and how to improve upon them” (p. 378). 1) It is imperative for each programme to clearly articulate key messages related to how it supports student learning and success. 2) Courses within a programme should be intentionally planned and aligned to support progression in the complexity of student learning and development. 3) Students must be provided with continuous opportunities to receive formative feedback on their learning achievements and opportunities for improvement. 4) Quality educational experiences should emphasize the creation of learning communities and environments which support collaborative peer development. I could not agree more with these recommendations and personally believe that an outcomes-based approach only helps to provide an effective framework for organizing and structuring this vision for excellence in curriculum planning and design. Knight, P.T. 2001. Complexity and curriculum: a process approach to curriculum-making. Teaching in Higher Education 6(3):369-381. An outcomes-based approach to education clearly specifies what students are expected to learn and arranges the curriculum such that these intended outcomes are achieved (Harden, 2007). 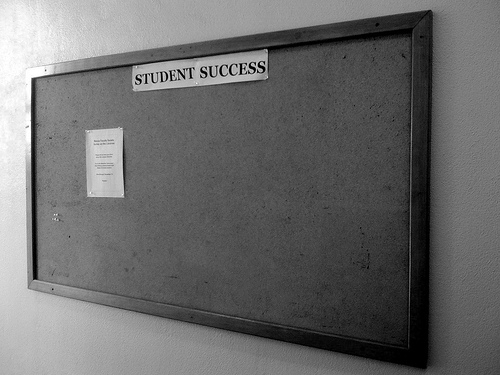 Learning outcomes provide the base for an effectively aligned and integrated curriculum, where instructional activities and assessment strategies are explicitly linked to course-specific and degree-level learning outcomes, which are tied to institutional and provincially-defined graduate degree level expectations (DLEs). help to ensure accountability and assure quality of our education programs. An aligned curriculum organizes structures and sequences courses around the intended learning outcomes. 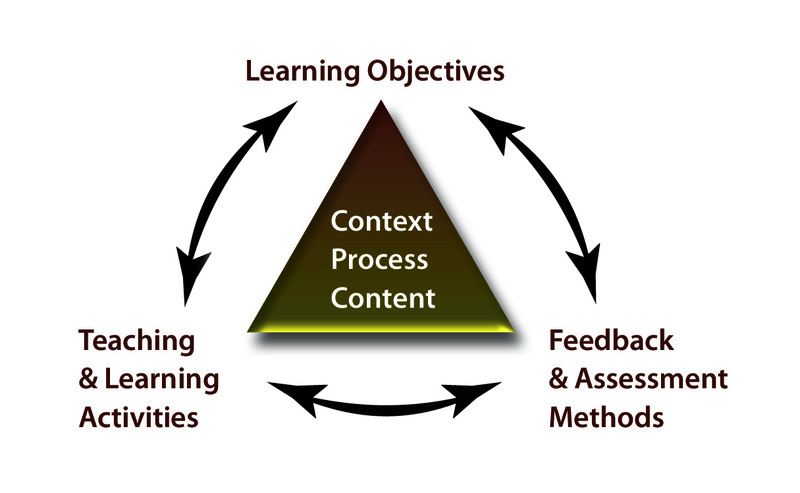 In order for this approach to succeed, learning outcomes must must be: 1) clearly articulated in a way that is contextualized within the discipline; 2) communicated broadly; 3) used to inform and influence decisions about the curriculum; and, 3) monitored regularly to ensure that they remain current and accurately reflect the intent of the degree program (Manogue and Brown, 2007; Harden, 2007). It is hard to argue with an outcomes-based approach to education. Starting with a clear goal of what one wants to achieve seems extraordinarily logical, even when situated within the inherent complexities of higher education! What is clear is that an outcomes-based approach requires a clear focus on continuous quality improvement. Harden, R.M. 2007a. Outcomes-based education: the future is today. Medical Teacher 29:625-629. Harden, R.M. 2007b. Outcome-based education – the ostrich, the peacock and the beaver. Medical Teacher 29: 666-671. Manogue, M. and Brown, G. 2007. Managing the curriculum – for a change. European Journal of Dental Education 11: 75-86. Research suggests that effective teaching and learning environments: 1) facilitate a deep approach to learning where students are actively involved and seek further meaning and understanding through experience, application, practice and reflection; 2) provide organization and structure through clearly defined goals, learning objectives and standards for performance; 3) provide opportunities for students to receive frequent feedback; 4) provide authentic learning experiences that establish personal and real-world relevance; and, 5) provide opportunities for independence and choice (Entwistle and Tait, 1990; Trigwell and Prosser, 1991; deWinstanley and Bjork, 2002; Lizzio et al., 2002; Newmaster et al., 2006; Weiman, 2007; Kember and Hong, 2008; Revell and Wainwright, 2009). deWinstanley, P.A. and Bjork, R.A .2002.Successful lecturing: presenting information in ways that engage effective processing. New Directions for Teaching and Learning 89:19-32. Entwistle, N. and Tait, H. 1990. Approaches to learning, evaluations of teaching, and preferences for contrasting academic environments. Higher Education 19: 169-194. Kember, D., Ho, A., and Hong, C. 2008. The importance of establishing relevance in motivating student learning. Active Learning in Higher Education 9(3): 249-263. Lizzio, A., Wilson, K., and Simons R. 2002. University students’ perceptions of the learning environment and academic outcomes: implications for theory and practice. Studies in Higher Education 27(1):27-52. Newmaster, S., Lacroix, C.A., and Rossenboon, C. 2006. Authentic learning as a mechanism for learner centredness. International Journal of Learning 13 (6): 103-112. Revell, A. and Wainwright, E. 2009. What makes lectures ‘unmissable’? Insights into teaching excellence and active learning. Journal of Geography in Higher Education 33(2): 209-233. Trigwell, K. And Prosser, M. 1991. Improving the quality of student learning: the influence of learning context and student approaches to learning on learning outcomes. Higher Education 22:251-266. Wieman, C. 2007. Why not try a scientific approach to science education? Change: The Magazine of Higher Learning 39(5): 9-15. “Large class sizes, the increasing diversity of the student corpus, and mounting cost-efficiency imperatives have become commonplace. In this context, a major challenge for academic faculty is how curriculum, teaching and assessment can be enhanced so that graduates will become more effective communicators and meet the needs of contemporary knowledge economies” (p. 89). Moni et al. (2007) present an innovative writing and peer review process aimed at first-year students in a human biology course at a research-intensive university, which represents an alternative to more traditional essay-type assignments. The students were required to write a 700-750 word personal response to one of a selected number of topics from The Science Show, broadcasted by the Australia Broadcasting Commission. The text was to present a scaffolded- level of cognitive development from providing a context and purpose in the Introduction (remembering, understanding), to a personal analysis of the topic in the body of the report, to a judgement section where the students were required to communicate their personal interest in, and usefulness of the topic both in the context of self and to society. In addition, they were required to present future research areas based on the discussion presented in the audio file. 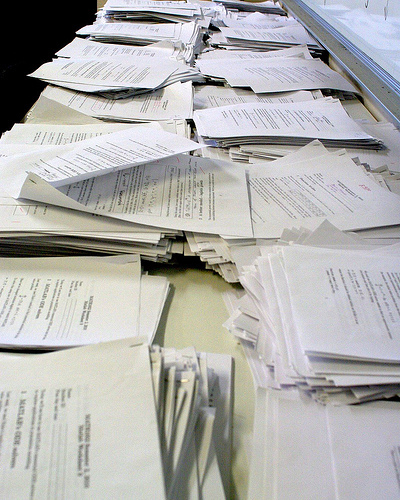 The students were asked to peer review a pre-selected portion of exceptional assignments – a clever technique for having students exposed to high-quality work. Moni, R.W., Moni, K.B., Lluka, L.J., and Poronnik, P. 2007. The personal response: a novel writing assignment to engage first year students in large human biology classes. Biochemistry and Molecular Biology Education 35(2): 89-96. Is there a relationship between students’ approaches to learning and their perceptions of learning environments? Hazel et al. 2002 present a compelling exploration of meaningful/deep (in comparison to rote/surface) learning in terms of the relationship between students’ approaches to learning and their perceptions of the learning environment, within the context of biology. Data was collected from 272 students from similar first year biology subjects at 2 Australian Universities. The Presage-Process-Product model was used to guide the research: Presage (Student Characteristics, Course Design/Teaching Methods), Process (Students’ Perceptions of Context/Learning Environment, Students’ Approaches to Learning), Product (Quantity and Quality of Students’ Learning Outcomes). They used a pre/post test based upon open-ended questions and a concept mapping exercise to assess key concepts in photosynthesis. Perceptions of the learning environment were evaluated via a questionnaire designed to evaluate deep/surface learning strategies, “good teaching”, clear goals, workload, assessment and independence. A hierarchical cluster analysis was used to examine the data. Comprehensive details regarding these methods are provided. This paper is extraordinarily interesting and well-researched. Three clusters of students were identified: an understanding group, a reproduction group, and an incoherent group (which demonstrated the poorest understanding). The reproduction group perceived the environment as more supportive of a surface-learning approach, and adopted a surface approach to learning. The understanding group found that the learning environment was more supportive of a deep approach and hence adopted a deep learning approach. It was noted that less than one third of the students demonstrated the deep/understanding learning pattern. The results for the incoherent group were mixed, although they perceived that the learning environment was supportive of deep learning, they adopted more of a surface approach to learning and demonstrated significantly less prior-understanding (although all groups demonstrated a relatively low understanding in the pre-tests). Perhaps most interesting, the reproduction groups’ understanding of photosynthesis decreased in the post-test, while the understanding group demonstrated an enhanced understanding of the topic, and higher achievement scores in comparison to the two other clusters. The incoherent group demonstrated the lowest level of achievement and understanding. The key findings suggest that perceptions of the learning environment and students’ approaches to learning can have a significant effect on their level of understanding of course concepts. The key questions that remains is, “…knowing that students do respond so differently to the same context, and that these differences are associated with differences in the quality of their learning, what can be done? Our approach is to focus on students’ awareness of the requirements of their course when they start, and on differences between staff expectations and students’ conception of learning of their subject and of key concepts in their subjects.” This study is well-researched and presented and highlights the importance of developing students’ awareness of both the process and content of subject-matter learning. The pre/post methodology also provides an interesting research model. Hazel, E., Prosser, M. and Trigwell, K. 2002. Variation in learning orchestration in university biology courses. International Journal of Science Education 24(7): 737-751.